Aflagin is a balanced formula of an organic acid acidifier that works together to promote each other's action. Aflagin aids in improving the digestive process with its effect as an antibacterial. 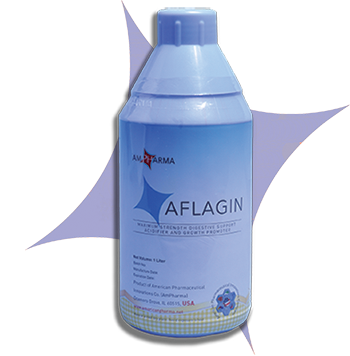 Aflagin works throughout the digestive tract, starting from the stomach to the intestine, reducing the pH of the entire digestive tract, thus promoting a better utilization of the feed. As a response of the increased pH, the pancreas increases its secretion of digestive enzymes that lead to better digestion and protein in feed utilization and inhibits the growth of E. coli and Salmonella and other pathogens. Aflagin, with its effect on increasing the pH in the intestinal cavity, helps in creating a suitable environment to promote the growth of natural flora, and accordingly, disrupts the growth of pathogenic enterobacteria. Aflagin also contains specific ingredients in the form of Cynara extract that help increase the production of bile and promotes a healthy gall bladder, thus improving feed conversion and weight gain. Aflagin can be used to help improve the digestive process and feed conversion. It also aids in the prevention of mycotoxicosis and intestinal pathogens. Aflagin is a potent weight-gain supplement and a highly effective growth-promoter. Aflagin can also be used to help increase bile secretion and in maintaining healthy gall bladder and liver function. To be added to broilers with the rate of 1 ml / 1 liter of drinking water for five days at the age of 28 days. To be added to the layers with the rate of 2 ml / 1 liter of drinking water for five days. Citric Acid, Propionic Acid, Lactic Acid, Benzoic Acid, Phosphoric Acid, Papain, Acetic Acid, Formic Acid, and other proprietary ingredients, including: artichoke extracts, Betaine Hydrochloride Mananologosacharide, Beta Glucan, and other patented mix. © 2005-2019. All Rights Reserved. American Pharmaceutical Innovations Company®.